Bottom: Normandy Veterans Memorial Plaque, Whitehaven, Cumbria. 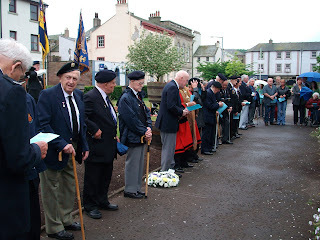 A new memorial plaque for the former West Cumbria Branch (Branch No 51) of the Normandy Veterans was unveiled inside St Nicholas' Chapel, Whitehaven by the Mayor of Copeland, Councillor Mike McVeigh on Sunday 6 June 2010. Henceforth, this will be a place where people will be able to come to find some peace and calm with their own thoughts or to listen to the comforting sound of silence. This memorial will also serve as a permanent reminder in years to come of the strong links between of the former West Cumbria Branch of the Normandy Veterans, St Nicholas' Chapel & Gardens, the Parish of Whitehaven and the local West Cumbrian community. This chapel - and the church grounds outside - have always been a special meeting place for the WW2 West Cumbria Veterans. 6th June - 22nd June 1944. 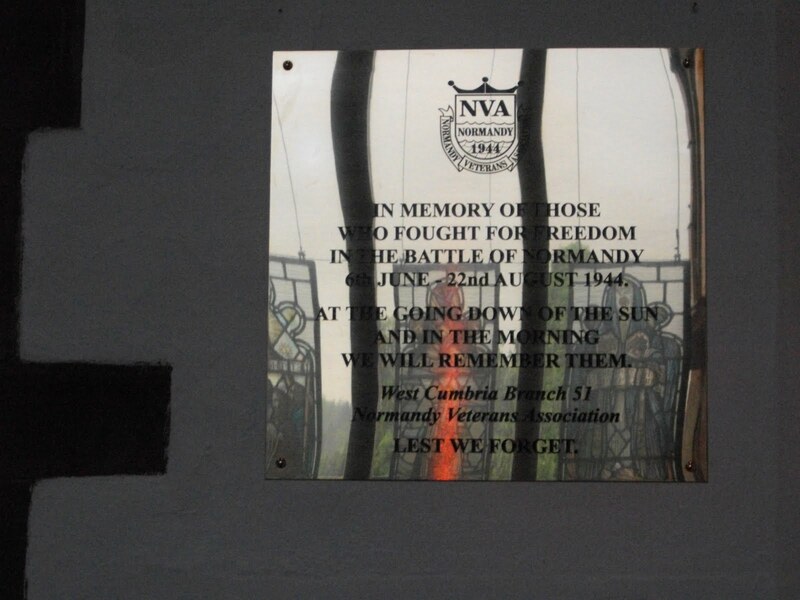 The new memorial plaque commemorating the sacrifices of WW2 veterans, and particularly those involved in the Normandy campaign was dedicated inside St Nicholas' Chapel on Sunday afternoon 6 June 2010. The Normandy veterans Association West Cumbria Branch Standard had been handed over to the Parish of Whitehaven after the disbanding of the Branch in June 2008. Largely thanks to the efforts of the family of the former Branch Secretary, the late Mr Jim Jolly, the new memorial plaque to commemorate in perpetuity this special relationship between the veterans and St Nicholas' Chapel was unveiled following a short memorial and thanksgiving service on the anniversary of D-Day. The grounds of St Nicholas' Church has always been a central meeting place for the town of Whitehaven so the memorial plaque will always serve as a visible reminder that in years to come people will always remember. Fittingly, Mrs Mary Jolly, Jim's wife, along with other members of the family were present at the unveiling. This may well be the last 'official' get-together of family and friends of the Normandy Veterans West Cumbria Branch. Unfortunately, some of the veterans were unable to attend the unveiling, most notably the former Branch Treasurer Mr Pat Kelly who had also been one of the driving forces behind the new memorial plaque that was being dedicated. Many other ‘absent friends’ were remembered during the service. The event took place on Sunday 6 June 2010, the anniversary of D-Day 6 June 1944. There were two parts to the service. Firstly, a short memorial service took place outside in the church grounds at the memorial plaque for Fallen comrades of the Normandy and other campaigns of the Second World War. This part of the service was taken by Reverend John Bannister, Rector of Whitehaven (Church of England) and Father Matthew Carney OSB, Parish Priest of St Begh's, Whitehaven (Roman Catholic), both of whom had arranged their busy schedules to be at this event. Reverend Bannister who hosted the event had served for several years as Chaplain to the West Cumbria Branch of the Normandy Veterans. A wreath commemorating the Fallen was laid at the memorial by the Mayor of Copeland, Councillor Mike McVeigh. Other members of the public were also able to lay their own tributes at the memorial to remember relatives and friends. The second part of the service took place inside the chapel, which is inside the tower of the former St Nicholas' Church. There were two Standard Bearers present at the event: Mr Jimmy Hughes, representing the local Kells Branch of the Royal British Legion, and Mr George Dunn representing the local regimental branch of the Duke of Lancaster's Regiment. At the beginning of this part of the event the standards were passed over to Reverend Bannister to be placed at the side of the altar during the ceremony. As previously referred to above, Councillor McVeigh was then invited to unveil the plaque which can now be seen by visitors to the chapel. I feel it is appropriate to add a few personal thoughts to put this event into the context in which it went ahead. Over the years I have attended numerous memorial services in Britain and in other European countries. Many of these have been at this very place in St Nicholas' Gardens, Whitehaven. Usually at these services there is a gunshot volley to announce the beginning of a two minute silence, and a bugler will generally play the 'Last Post' afterwards. Often, when there is a short march there is also an accompanying band. So far as I can recall, this was the first time I have ever attended such an event where there was no gunshot volley and no bugler. There was no accompanying band either. The two minute silence still took place in the Church Gardens. Everyone seemed to know when the silence should start and when it should end. The first part of the event, which was outdoors, was underneath grey skies and it rained heavily. In many respects, this event was much the same as many of the other commemorative events I have attended, and in other ways totally different. Why was there no gunshot volley or a bugler for the 'Last Post'? Originally, the plan had been to have both. They were cancelled a couple of days earlier because of other events nearby in West Cumbria. 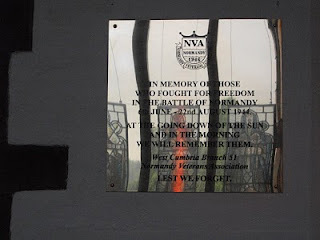 On Wednesday 2 June 2010 - four days before the dedication of this memorial - 12 people were killed and about 25 others injured by a lone gunman at 30 different sites in the locality. The gunman later committed suicide. One of the 12 victims who died and some of those most seriously wounded were shot at a taxi rank across the road at the back of St Nicholas' Church Gardens within sight of where this service was held. There are now gunshot holes in the walls of some nearby buildings, similar to the ones that can still be seen on the walls of buildings where some of the fighting took place in towns and villages in continental Europe during WW2. This anniversary was held 66 years after D-Day, and the beginning of the Liberation on N.W. Europe. With the nearby fatalities and the other events in the days leading up to 6 June 2010 suddenly the war years did not seem so long ago. Many people had laid floral tributes or messages of support on the nearby street, or in the Church Grounds, for those who had been killed. Some relatives of the bereaved and injured were still visiting the site to pay their respects, with their own thoughts and personal grief. Thus, it was decided to continue with the dedication service as planed, but without the sound of a gunshot volley or a bugle. Sometimes it best to just listen to the sound of silence. All the WW2 veterans present had experienced the tragic loss of family or friends during the war and have lived and coped with this loss ever since. It was therefore appropriate at this time and in this place to hold a rather more sombre, quieter and peaceful event. Those who had suffered a recent bereavement a few days earlier had enough to cope with in their grief at this time. So there would be no sound of gunfire, even though it would be with blanks, at this dedication. The heavy rain and heavy skies perhaps fitted the mood of the occasion. All the victims of 2 June 2010, and their families, were also remembered during this dedication service. Another unusual thing about this service was the fact that the Gardens seemed to be completely surrounded by TV crews, satellite dishes and antennae. The TV crews came from all over the world and were preparing for a much larger and longer event a couple of hours later specifically dedicated to commemorate the victims of June 2010. Fortunately, these TV crews respected the wishes of the veterans to be allowed to dedicate their memorial without much intrusion. Sometimes it is best just to listen to the sound of silence. May they all rest in peace! It includes additional photographs of the veterans, and some of the veterans speak about their wartime experiences. Click here for the link that Joseph mentions above. "No Invader shall take our land".